Languishing between the Caribbean heavyweights of St Vincent, Martinique and Barbados, the Windward island of St Lucia is undoubtedly one of the most idyllic locations on the planet. Aside from all of the enviable sand beaches and warm Caribbean waters, one of the stand-out features of the island is its volcanic landmarks and visitors will be treated to plenty of geo-thermal hot spots from where to relax and soothe their cares away. 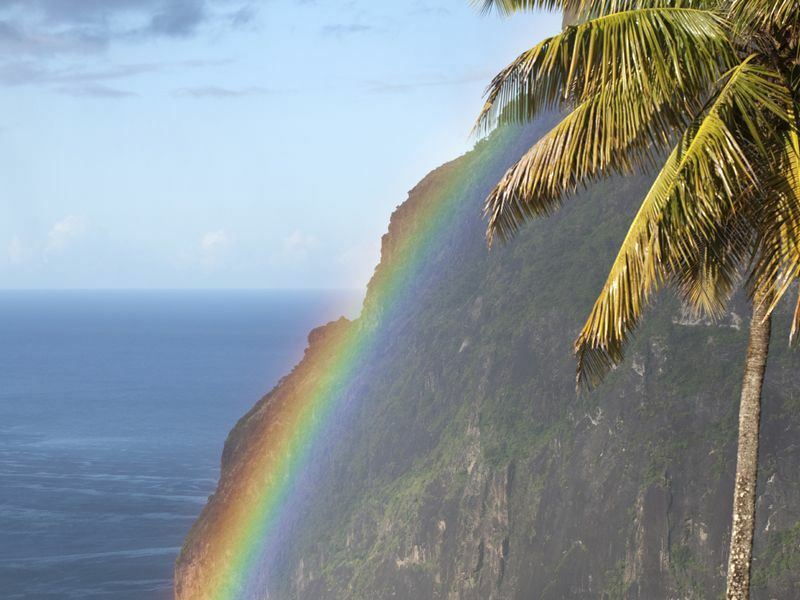 Other alternatives to idling away days at the beach are the Pitons which can be found along the island's southwest coastline and are well-known for their walking trails and unparalleled views. With a fascinating colonial heritage as well as some awesome sure-fire ways to get your adrenaline pumping, St Lucia is one of the most active Caribbean islands in more ways than one and if you fancy finding out a few more reasons to treat yourself then check out the top 10 things to do in St Lucia below. What: Not many islands can boast a genuine drive-through volcano however, St Lucia can and if you're in the mood for mud baths and hot springs then you may want to visit the westerly town of Soufrière to find out more. The volcano in question is the dormant Qualibou and the corresponding geothermal activity is a big draw for relaxation-seekers especially when combined with a trip to the coast and the beautiful beach of Anse Chastanet. What: A ride on a rainforest tram is a far more sedate experience as opposed to zip-wiring and as you listen to the knowledgeable tones of your nature guide and watch as hummingbirds buzz overhead you may be forgiven for wondering where it all went so right. This is a great way to combine all the sights and sounds of a tropical rainforest with a really comfy ride and although there is a slight amount of hiking involved you certainly won't begrudge a few aches and pains once you check out your camera film. What: Situated to the north of St Lucia's capital city, Castries, Gros Islet is the home of the Windward Island cricket team and features the Beausejour Stadium which can host up to 20,000 fans. Not only is the town renowned for its love of cricket it's also well-known for a legendary Friday night street party which has been fondly nicknamed the 'Jump Up'. If you're into your street food, calypso tunes and good times then this is certainly the place to be on a warm summer's evening especially after the local team's won and the whole island is rocking to the reggae beat. What: If you really want to discover St Lucia in some style then a helicopter ride is definitely the way to go. 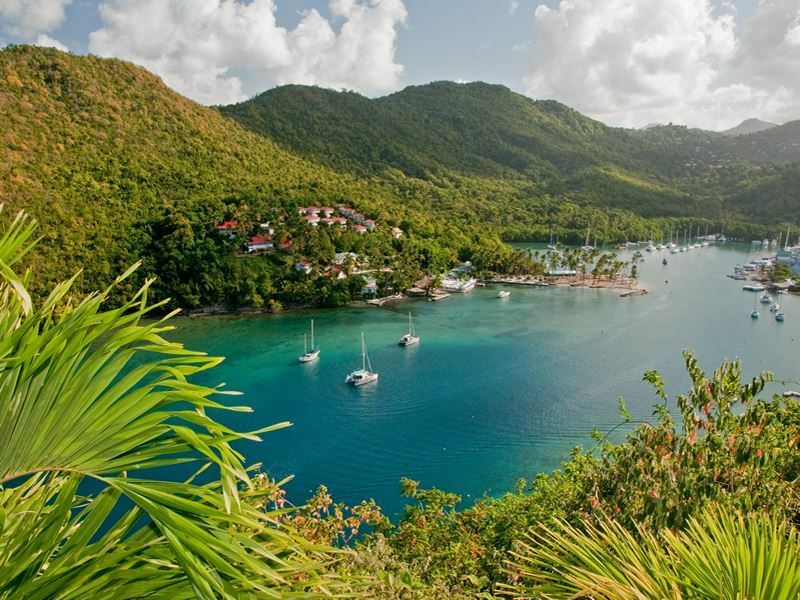 Swooping and buzzing over the lush green plantations before following the shimmering coastline is simply one of the most glamorous and exciting opportunities in the Caribbean and a must for anyone who's ever dreamed of being James Bond for just a few moments. Tours usually take in all of the major sights, including: Castries, Fort Rodney and Rat Island, and with an accompanying commentary you'll get to discover more about the island's heritage as well as getting some awesome shots to make the folks back home green with envy. 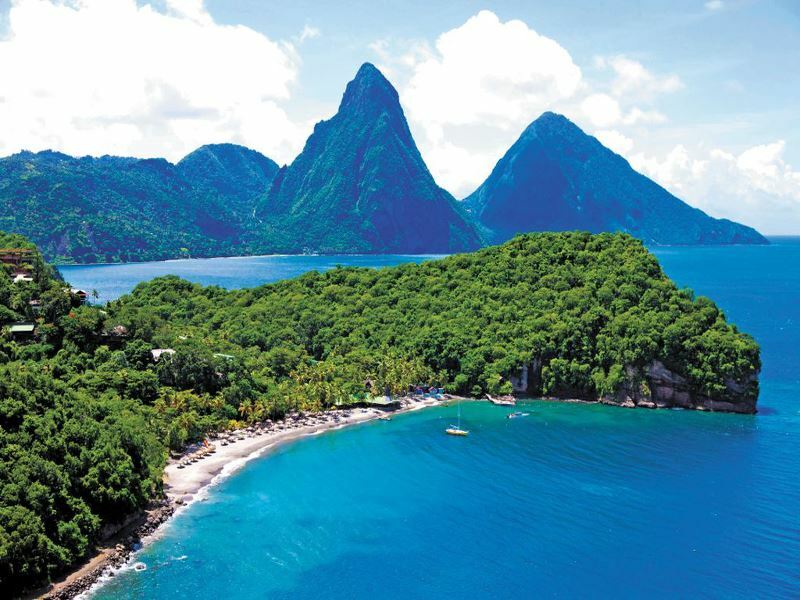 What: As mentioned, the Pitons are situated on the southwest of St Lucia and come in the guise of two volcanic giants aka: Gros Piton and Petite Piton. As you may expect, Gros Piton is the larger of the pair, stretching towards almost 2,700 feet, and this is where you'll discover some great spots to climb as well as various challenging and easy-going hiking trails. The smaller sister is just under 2,500 feet tall and is reported to have even greater views although the trails are pretty rough to say the least. What: If you've recently purchased a floppy hat to keep the sun off then you may want to hold onto it because zip-wiring in St Lucia is as fast-paced as it's, quite literally, breath-taking. Checking out the tropical canopy from such a vantage point gives you a fascinating insight into what makes the jungle tick and as you launch yourself from one platform to the next the temptation to yodel like Tarzan is never far behind. Where: on the east of the island amongst 1,000 acres of estate land. What: Helmets on, throttles deployed and off you go on one of the most exotic quad-bike trails on the planet. This is not only exciting and great fun it's also a really comfortable means of checking out the island and from discovering a huge variety of fruits and flowers to finding out more about the local agriculture, ATV tours are designed with you and the environment in mind. What: Imagine the warm Caribbean sunshine on your back as the surf from the ocean kisses your cheeks and tousles your hair. 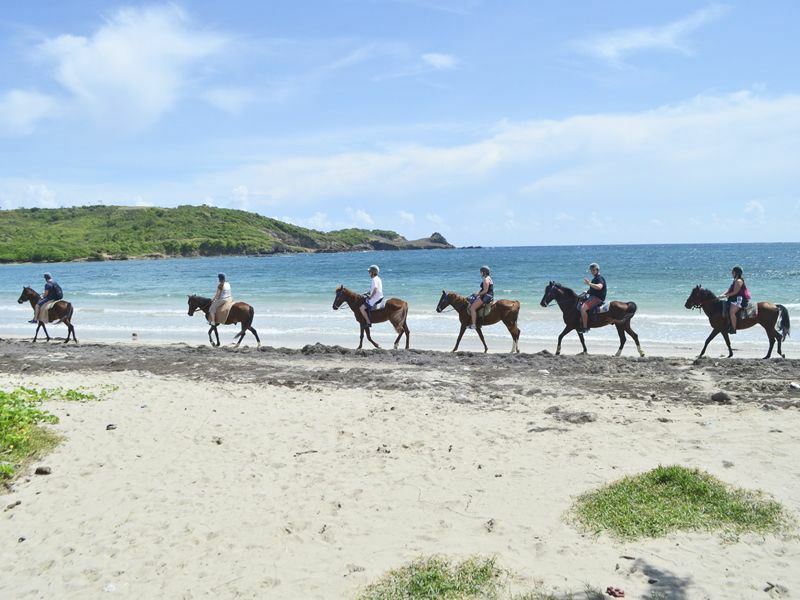 This is pretty much par for the course in St Lucia and if you fancy going all romantic then why not open your billowing white shirt to the naval and mount a noble steed to experience horseback riding on the beach. This is a far cry from pony trekking in the Lake District and even if you don't know your stirrups from your jodhpurs you'll no doubt find the right pace to suit you. 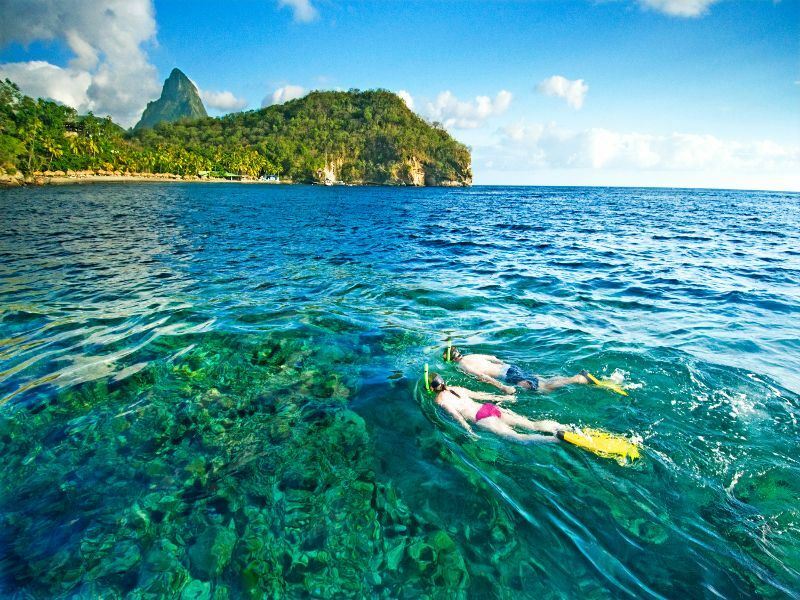 What: Snorkelling and St Lucia go together like rum and pineapples so if you get the chance to apply face mask and flippers then grab it with both sun-tanned hands because opportunities like this don't come along every day back home. One of the top spots on the island to experience the vibrant coral reefs and tropical fish is Anse Chastanet Marine Reserve which lies to the southwest and offers a simply stunning underwater experience like no other. What: Whatever your level of experience hopping on-board a catamaran in St Lucia pretty much ticks all of the exotic adventure boxes in one sensuous swoop. Hire your own craft or let a crew take the strain because this is one of the best ways to make the most of the warmth of the Caribbean as you tour around the coast. Stop off to explore deserted beaches or just kick back with a rum punch and an engrossing book about pirates, however you wish to play it, it's all good.